I gave a presentation to some corporate board members recently, and they had one primary question on their mind. Why is overall gold demand weak? These are smart people. They’re successful, both professionally and with their investments. They even believe in owning a little gold. But they’ve been puzzled by the significant drop in demand for physical metal. They had some ideas, which were mostly right, but their main concern was if they were overlooking some critical factor that was making other investors ignore gold. What was especially interesting was their reaction. Once they grasped the reasons why physical demand has been down, they instinctively concluded that they needed to buy more of it. Now. Why is Gold Demand Weak? There are a number of reasons why demand for physical metal has fallen, but these are probably the main ones. 1. Trump. Since Donald Trump became president, there has been a 60% decline in Eagle coin purchases (gold, silver, platinum, and palladium). Some investors obviously felt less of a need for gold when Trump won. 2. Cryptocurrencies. Some currency that might go to gold is going to cryptos instead. It’s almost as much as an entire year’s worth of new gold supply. This has put a dent in the amount of gold and silver purchased. 3 Rising Stock Markets. For the average mainstream investor, both retail and institutional, why buy gold with all this excitement? Even the board members were surprised to see how many new highs each market has made year-to-date (and that number has gone up since my presentation). 4 Complacency. This chart from CNN Money shows the VIX (volatility index), a common measure of fear in the marketplace. You’ll see it’s down by over a third in the past 5 years, and sits near record lows. If you don’t have much fear, you probably think you don’t need a lot of gold. I pointed out why these are actually reasons to BUY gold. 1. Trump: Not all policies will succeed (no president has had all their objectives met). The level of spending he wants will likely lead to inflation. Geopolitical conflict is an ever-growing possibility. a. By any measure, cryptos are in a bubble. A new one is added every day, sometimes more. Both the pace of growth and soaring prices are unsustainable. History clearly demonstrates all bubbles pop. b. Cryptos are still speculative in nature. There are 1,147 of them now (as of October 2), and only a small percentage will ultimately succeed. Also, prices are currently too volatile to gain widespread adoption. c. It is hard to trade cryptos legally in most major economies. China has banned exchanges (and at the same time is launching an oil futures contract redeemable in gold). d. Government regulation is almost certainly coming. The blockchain is likely to grow in use, but that will necessarily entail greater government intervention. Watch how government agencies respond after the first major report of money laundering or terrorist activity. This will largely negate the anonymity feature of cryptocurrencies. e. Last, cryptos will not replace gold. Among other reasons, they simply don’t have the market breadth to do so. 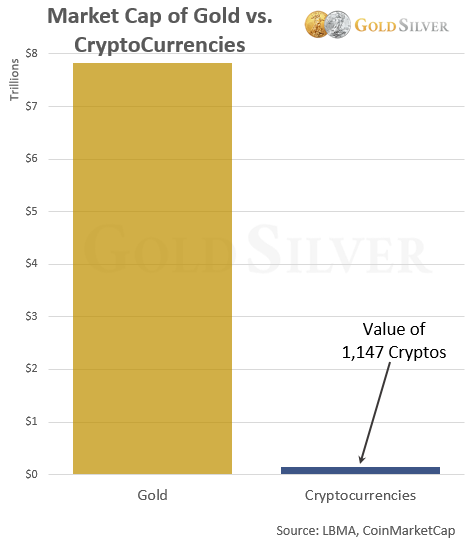 Here’s the value of all above-ground gold (at $1,250) vs. the market cap of all cryptocurrencies currently in existence. The cryptocurrency market may yet grow, but keep in mind that it took gold 3,000 years to reach that level. Cryptos can’t compete with this. 3. Stock markets are overvalued. The fact that stock markets have carved out so many new highs in nine months is cause enough to take out some insurance. And the risk of a crash grows as the bubbles get bigger. In contrast, gold is negatively correlated to stocks, so is a perfect hedge against lofty equity prices. Further, both gold and silver are undervalued: gold is down 32% from its 2011 high, and silver down 65%. Insurance is currently cheap. 4. A crisis is inevitable. Our research shows a monetary shift is coming, which is always accompanied by economic turmoil, along with a massive loss in purchasing power of the currencies in use. And this doesn’t count the unavoidable downfall in stock, bond, and real estate markets, nor the inevitable recession. The best hedge against these events is gold. Indeed, the metal is just as likely to become an offensive profit-making investment as it is a defensive asset-protecting hedge. The need to be overweight gold at this point in time is glaring. A correction is inevitable, it’s only a question of timing. It is likely to be big given the size and length of the run-up. Real estate is overvalued again. We learned in 2008 that property values do not rise forever. The risk is high for higher inflation. This is Fed’s goal. Bonds have interest rate risk, inflation risk, and in a crisis, default risk. Debt inhibits growth. It can also lead to crisis, and make the crisis worse. We are now in the third longest economic expansion since WWII. This signals economies are not as strong as we’re told. The corporate board members I met with decided to buy more gold. Risks in the financial system are clearly elevated, and gold is the best hedge against them. They also like that it is undervalued compared to most other asset classes. I hope you, like them, will buy a sufficient amount of gold to withstand whatever will soon come our way. Mike and I continue to buy. I bought another one of these last week.